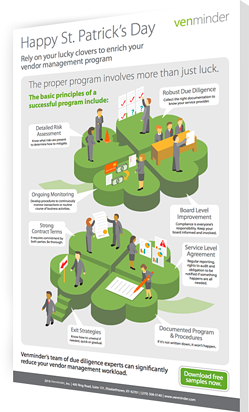 To join in the fun of St. Patricks Day every year, we've put together a simple infographic on the basic principles of a successful vendor management program. However, you should definitely use this all year round. While the proper vendor management program involves more than just luck, for a well-documented, well-planned and executed program, make sure that each of the leaves on these clovers are covered.